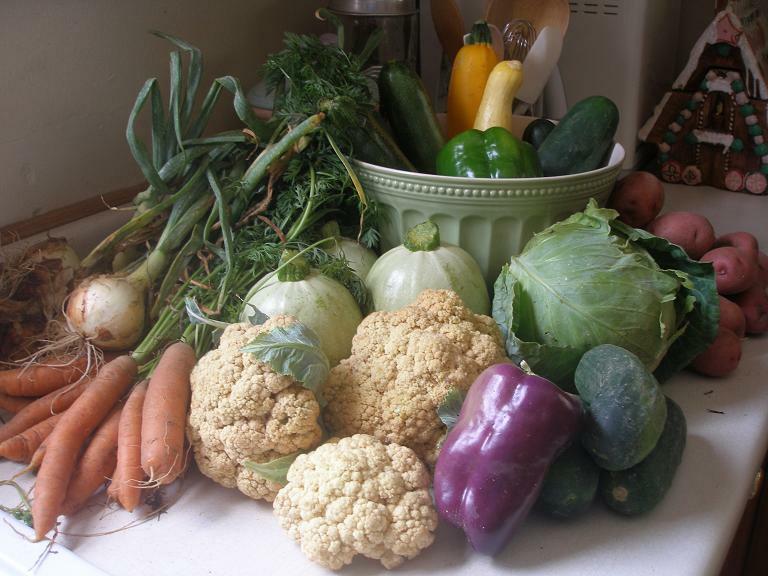 Take a look at the beautiful bounty in this week’s CSA share, waiting to be washed on my kitchen counter! From left to right there are walla walla onions, carrots, q-ball squash, cauliflower, cabbage, purple bell pepper, pickle cucumbers and red potatoes; and in the bowl: three kinds of squash (zucchini, crookneck and yellow), cucumbers, and a green bell pepper. This was my first week back up at the farm, and I had Henry and Emmett in tow. Everyone was excited to see Emmett! And Henry had a great time catching toads and playing with the other kids, while Emmett rode in the Moby wrap as I distributed squash and sorted garlic. This week, in our newsletter from Monroe Organic Farms, Jacquie Monroe wrote up a piece on what farm life is like. They work hard and are quite busy… she only got through two days worth! A member once asked what a week on the farm looked like? What was our routine? Well…let’s start with just a couple of days! Our week starts on Sunday at 4:30 or 5 am with Jerry setting his water on those parts of the field that need a little drink. This takes approximately 3 hours. Setting water isn’t like turning on your garden hose. The ditch fluctuates up and down according to users up stream. Once the water is set, he goes back a half hour to an hour later and checks it again. He may have to irrigate fewer rows or start additional rows depending on how much water there is at that time; then checks it one more time before he starts his next project. In the mean time, our employees get going about 6 am. They have gathered eggs, watered and fed the chickens, steers, pigs and sheep. At 8 o’clock, everyone meets at the barn. They take what produce has returned from the Saturday farmers markets and reload a truck. Kyle takes off at 9 am for the Ft. Collins farmers market. He will be there for 5 1/2 hours. Once Kyle is set and has left, Jerry turns to the four wheeler and checks the field for mature crops. It is at this time when he decides what you will be getting each week. He come to me and gives me a list of crops and how much he believes we have. I take those numbers and apply them to the membership. Sometimes we are limited to what we have, so you will only get one, or he tells me to calculate three different numbers. Jerry has now moved to either his cultivating tractor or the planter. If he chooses to cultivate, he will do this all day, taking out as many weeds as he can so that the hand hoeing won’t take as long. Planting is a timing thing. If Mother Nature cooperates, Jerry is pretty good at getting you crops on a pretty regular basis. To give you an idea, corn and green beans need to be planted every week; cucumbers & summer squash every three weeks; peppers, and potatoes one time; watermelons & muskmelon every four weeks; carrots, tomatoes and beets three times a summer and broccoli and cauliflower are planted five times a summer. This job requires he get on and off the tractor several times to check to see if the seed is planted at the right depth; making adjustments to the planter as needed. Meanwhile the guys are digging up potatoes for Distribution on Tuesday. They are stored in a strawbale building. The strawbale building is approximately 20 degrees cooler than the outside temperature! They will set up sprinkler pipe to sprinkle up the seed Jerry has just planted; moving the pipe every three or four hours. This will need to be done every three days until we see a crop. Then it will be switched to row irrigation thereafter. Some of the crew will be hoeing, stacking the newly cut & baled hay and gathering eggs (which will be done at least once more before the end of the day). If there is time, three people will use the tractor and a machine called a Weeder to cultivate. We take an hour for lunch (Jerry doesn’t come in for breakfast, too much to do & he wants to do it while it is cool!). But before he quits, he checks his water again. If it needs changing, he will do this, checking it again after lunch. Jerry wants a hot lunch so I normally fix him leftovers from the night before; afterward going back to the planter or cultivator. I get up in the morning and check messages. (I don’t get up nearly as early as Jerry!) Get a bite to eat & read a favorite magazine for an hour. I then sit down to my computer and start writing. Sometimes these newsletters come easily to me and I will be finished by noon and sometimes they will take me all day to write. When I’m done, I count our earnings from the Saturday farmers markets and partially start a deposit, finishing it on Monday after adding Sunday farmers’ market earnings. While I’m busy making the deposit, I start to make the copies I need of the newsletter. I will answer the messages and if I have time, (between Sunday and Monday), I look at email. It is very low priority for me, especially since I love the computer so much! I can usually find more “important” things to do! Things like laundry. It’s funny how having clean clothes really make you feel good…ha, ha! Dinner is served somewhere between 5 and 6 pm. Jerry needs to eat early because it will take him another three hours to change his water to new locations. We end our day watching the 9 o’clock news (the weather) and going to bed. Monday morning at 4:30, Jerry begins with setting his water. This is a daily occurrence. If he isn’t row irrigating, he is irrigating using drip. To conserve water, we use plastic tubing to move water from one place to another. This prevents water from evaporating or soaking into the dirt below the ditch. All of it stored water from reservoirs holding the spring melt off of winter snow or spring rains. We have settling ponds to remove as much of the silt (fine dirt) from the water. Before sending it into our drip irrigation system, there is a filter system that takes out quite a bit more. These filters need to be checked frequently. Anything goes wrong and it will shut down not sending water to plants in need of water! If Jerry didn’t finish planting or didn’t plant at all, it will have to be done on Monday. If there are any equipment failures, they will be worked on either Sunday or Monday. That includes the trucks too. Trucks are cleaned out from the weekend farmers markets. Any food that is not up to snuff to resell is fed to the animals. They are like dogs, begging for treats, running after the truck! Meanwhile the employees are doing the animal chores. From my calculations, they will start to pick what is needed for Tuesday Distribution. The harvesting will take up most of their day. Bringing everything into the barn and set up in order they will appear in your bag. Stopping only to move sprinkler pipe. Monday, I finishing the deposits, make the worksheets out for the Tue. Working Members & finish doing my laundry. Twice a month I pay the bills and Monday is the day I usually run errands for the farm. Jerry always needs parts for equipment; I take the deposits to the bank and go to the Post Office; go to the grocery store and ending the day with a nice meal. In the evening, Jerry and I take a ride on the four wheeler and look at the farm in all its’ glory; getting excited about the next new crop we’re going to give to you! BEAUTIFUL bounty indeed, i’m jealous! I’m bummed I missed meeting Emmett! Next week, I guess. It’s good to catch up. I’ve been missing you the last two weeks Annie! I’m actually taking next week off, so it’ll have to be the week after! Can’t wait!